The Thought Pad: Is a Perfect Society Possible? Can a perfect society exist? Is the existence of a flawless society of humans possible? Well, I ain't got any frikkin' ideah. they made me ask myself the question that I very obscenely pasted into the title of this post. My answer, to that, would prolly begin by asking the definition of "perfect". Does perfect mean that the happiness index is highest? Or does it mean that the rate of progress in science/art is highest? Because, my humble and idle reader, you must clearly see, that "meanings" of "perfect" are quite contrary to other in terms of parallel sustenance. 'Perfect' being a very mean word on its own. When we're all happy, nobody would bother progressing, and when we're progressive, all of us won't be equally happy. There. But what I just said, is nothing new. We all know that and also that, that I merely dodged the question (that I myself posed in the first place) in the most hideous and pedantic manner. To answer now, I'd say, it's really hard to have a perfect society. At least the kind of society in which perfect means the way I see it. And the way I see it, "perfect" means so much and encompasses that very much, that by logic, it defeats perfection itself, reaches a state beyond perfection, which I call the perfect-perfection, and so it becomes unattainable, in fact, rather unthinkable. On our road to perfection, we might begin by dissolving differences, by diluting the variations of color, caste, creed, language - which I believe are foremost in requirements (if there were any) but then how formless or bland that society would be? How plaintive would be the morphology of such a society which has no differences or shades or nuances? But then, in our pursuit of those differences, we pose the risk of losing equality. And even if, we do manage to bring everything to equality, can we really control conditioning (or bringing up of a human) so flawlessly that it achieves our set standards and goals? And if we do, where are we headed? To a brave new world? Oh Lord! Oh Ford! And so I'd stop the rant, and recommend Thomas More's Utopia for further reading if you really cared and didn't hit the little cross on the top right hand corner so far. 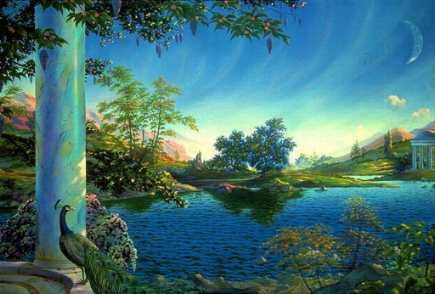 For, Utopia is a perfect place and a place that, literally, doesn't exist. Current Music: Soundtrack from Mel Gibson's "Braveheart"
It all comes to perspective. It would be impossible to have a perfect society because of our unique preferences and differing definition on what "Perfect" means. "1984" is one of my favorite books and even in that world, those who led believed in the perfection of the system ... a flawed system obviously. Even in Thomas Moore's "Utopia" where private property does not exist would be a nightmare world for Ayn Rand. Perfection comes in the total agreement of viewpoints and we all know that's a fantasy. Conflict is drama ... and drama is life. I couldn't agree more with ya. And you know I did like Ayn Rand's Atlantis Utopia in Atlas Shrugged but still its highly unfeasible I think. I agree "Atlas Shrugged" is part philosophy and part fantasy. I do think that we need to read about such idealistic works. We're a flawed species, but we have moments of greatness ... BTW they made a movie out of "Atlas Shrugged" (bad reviews and it's a two parter) but I saw "Fountainhead" years ago and her work does not translate well into film. This is my first visit to your blog and I really like your post gr8 observation keep posting..! Those are some nice reflections. We have this notion about science that with it we're heading toward progress but it's more like it's a tool in the hands of "power" which, given its greed and hell-bentness, would cause more damage than good. An utopia, then, is a mirage and it can be built only upon the ruins of what-once-was and not from the ground up. It's tempting to say we had the chance of building one from the ground up a long, long time ago, by remaining aboriginals, but it never was thanks to our nearsightedness besides what not. Thanks Sridhar and Shoaib for visiting and liking! Your comment shows clearly that there are many angles through which this complex topic can be viewed. I'm glad you shared it. @All It's interesting to see how talking about general things, attracts more comments but my obsession with personal rants is the primary reason behind the existence of this blog. So I kind of apologize in advance if you, a new reader, find every other post non-satisfying in nature. 1. Nothing dramatic happens (which will most probably be the case). 2. Islamic Fundamentalism dominates the world. We might perhaps go into the dark ages. 3. Capitalism takes its extreme form. If this happens, the divide between the rich and poor would force a social revolution, leading to a re-birth of Communism. The world will witness more Marxes and Engelses. And then when Communism begins to rise again, we will see more Smiths and Fords and the cycle will never end. 4. We are obsessed by scientific innovation. A world imagined by Huxley takes shape. 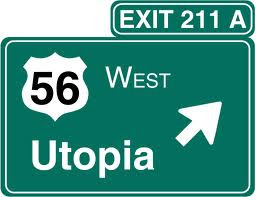 "For, Utopia is a perfect place and a place that, literally, doesn't exist"
Fun fact: A British novelist named Samuel Butler was so very much in agreement with that sentiment that when he wrote a satire about a fictional 'utopia' in the late 19th century, he named his work Erewhon. ^^ Yes, Erewhon, I did hear about that name somewhere but just can't remember presently. Most interesting word play in this context. Tanya, it's imperfections that make a person (and, hence society, on extension) human and interesting. A perfect world is a boring world. Perfection, as a goal in itself, may also be downright dangerous. Case in point (well, fictional) the movie 'Equilibrium'. A perfect society - no hatred, no wars, all man is equal. Motive is great; the means are not. Emotions are illegal, here. Humans are, thus, perfect robots. Nice blog, btw. Hope to be back.